by Buckner F. Milton, Jr.
Now normally I side with the pirates – it’s in my nature. But in this story I just had to root for the naval captain. Sorry, not story – this is history. And a fascinating piece at that. Word has it that at the time these events gripped the nation (the OJ trials of the 1800s, I suppose,) but today not many have heard of the Somers. 19 year old Philip Spencer was a midshipman, the son of the secretary of war, and trouble. Insubordinant from the get-go and selfish to boot. That may be all forgivable, but when he’s stationed on the Somers, a training vessel manned almost entirely by children, well, that’s when I draw the line and playful mutiny becomes cold-blooded murder. Of course, Captain Mackenzie learned of the plans in advance and dealt with it as best he could, but you can read about that yourself. This book was a fascinating read, and a rather easy read as well. It opens up some difficult moral questions about a captain’s responsibilities while at sea, where the safety of his crew and the letter of the law may not always coincide. Highly recommended. 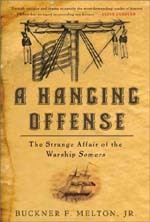 This entry was posted in Books and tagged history, milton, navy, non-fiction by Bilgemunky. Bookmark the permalink.